The sun bleached and windswept remains of two krummholz trees stand gaurd on top of Trail Ridge in Rocky Mountain National Park. Life is a struggle at this high elevation. 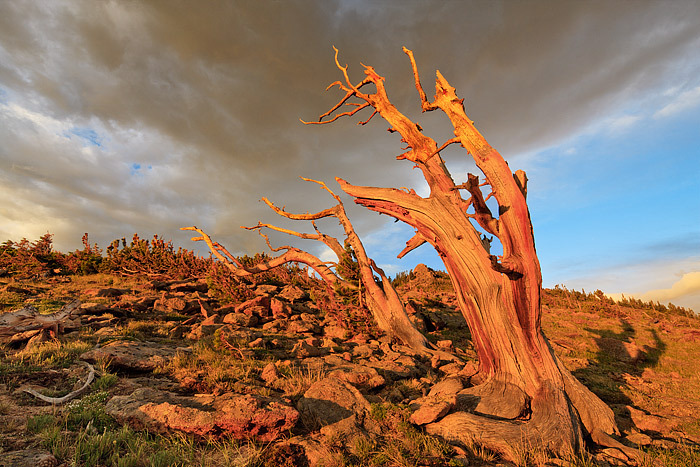 At treeline, trees such as these are shaped and molded by the high winds the constantly batter their trunks, causing them to grow only in the direction away from the prevailing winds. This morning the winds were still moderate as the sun's rays lit the ridge a brilliant orange as clouds moved overhead. Photo © copyright by Thomas Mangan.